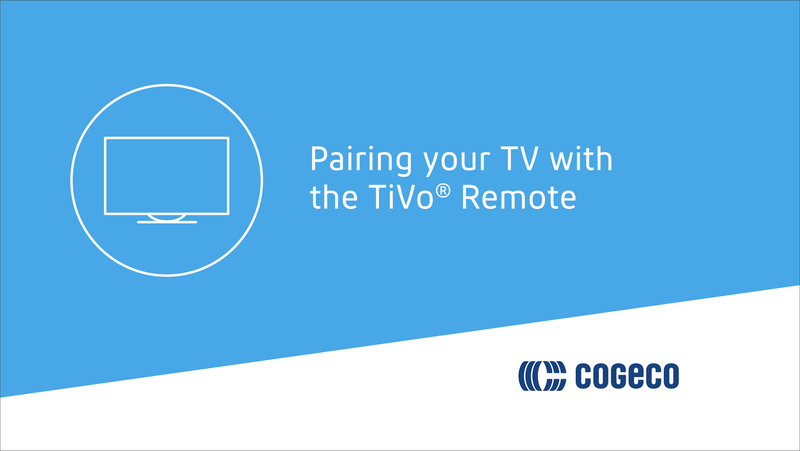 Your TiVo® remote is packed with features that can enhance your TV experience. Read on to learn more. Select Remote, CableCARD & Devices. A menu page will then appear displaying 5 more steps, which will allow you to program your remote control. Select TV Power, Volume and Mute buttons. Select your TV’s brand from the on-screen list. Follow the on-screen instructions: press and hold the PWR and TiVo® buttons simultaneously for 5 seconds, then enter one of the 4-digit codes from the top of the screen. Select A/V Volume and the Mute button. Select your sound system’s brand from the on-screen list. Follow the on-screen instructions: press and hold the Mute and TiVo® buttons simultaneously for 5 seconds, then enter one of the 4-digit codes from the top of the screen. Your TiVo® remote can be used in RF mode (radio frequency mode, which lets you change channels, even if your receiver isn't visible (e.g. hiding behind your TV). You’ll know your remote is in RF mode if an orange light appears when you push a button. Press and hold the BACK and TiVo® buttons simultaneously for 5 seconds, then place the remote control on the receiver. The orange light on the remote will stop blinking as soon as the pairing is complete. If you want to switch back to IR mode (infrared mode, where a red light appears when you push a button)—i.e. the normal mode where you have to point your remote at your receiver to control it—press and hold the C and TiVo® buttons simultaneously for 5 seconds. To switch back to RF mode, follow the same steps with the D and TiVo® buttons. If you’re always losing your remote and have a TiVo® PVR, try the TiVo® “remote finder” feature. If you have a high-definition (HD) PVR, just touch the amber image on the front of the PVR to activate a familiar TiVo® jingle on the remote. If you have a TiVo® 4K PVR, press the button on the back of the PVR labelled “Remote Finder”. When you find the remote, press any button to deactivate the sound, or just wait 15 seconds for it to turn off automatically.